Between land and sea, this 2nd floor apartment of 40 sqm with terrace of 11 sqm is located in the center of St Jean de Luz. Up to 4 people, it is the perfect place for a family holiday with 2 children or friends. With its large living room and terrace, this tasteful apartment offers all the comfort and pleasure of beautiful holidays with family or friends, near the beaches and near the cozy town center. The apartment was just as described and wonderful. The patio was perfect, even during the rain as there was a small covered area that allowed us to drink our wine and enjoy the time. We bought internet service from a local provider to use with our U.S. Phones that worked...adequately. The location was great with shops galore nearby and a grocery store within 1/2 block. Restaurants glittered the whole district leaving us stuffed. Plus, the city's location allowed us easy driving access to all of the Basque region which included the jambon de Bayonne, Rioja wine, and Basque cheeses. Parking was a small challenge, but once we understood where to park for free, the rest of our stay fell into a wonderful week. lovely little apartment, perfect for two. Very well equipped, great location, amazingly quiet in view of proximity to the bustling town and short walk to amazing beach. Les cles du pays basques provided excellent concierge service, allowing us early access. We mayn well go back to St Jean, and if we do we will try to book this place again. Thank you, Mme Katicha, mille remerciments. Logement bien conforme à la description. Appartement très bien situé dans le centre et pour aller à la plage . Logeme t très calme et vu le mois d exception que nous avons eu nous avons profité de la terrasse matin midi et soir comme si c était une pièce en plus. Un appart charmant, avec tout ce qu'il faut, proche à tout, mais calme et relaxant. 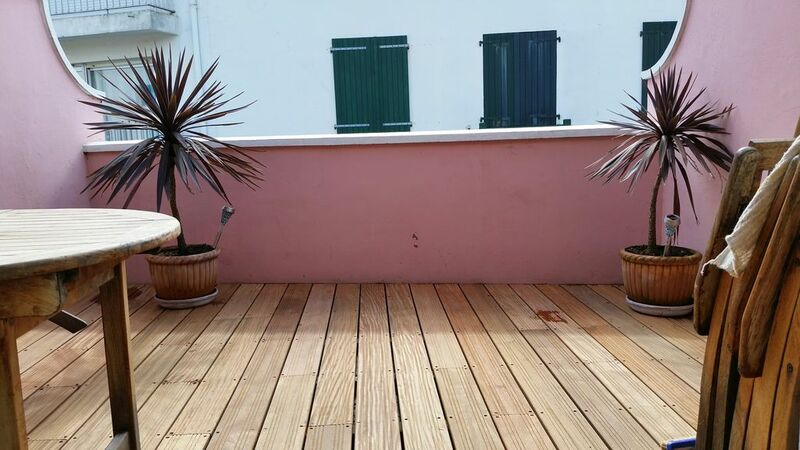 This apartment is located in the heart of Saint Jean de Luz, 50 meters from the pedestrian street and its many shops. The beaches are 300 m, one can enjoy a small meeting of lazing on the sand or learn surfing or windsurfing.